This is an exclusive limited edition commemorative cover produced by the Israel Stamp Collectors Society and the International Stamp Coin Collectors Society honoring Robert Tyre " BOBBY" JONES Jr. on this First Day of Issue. 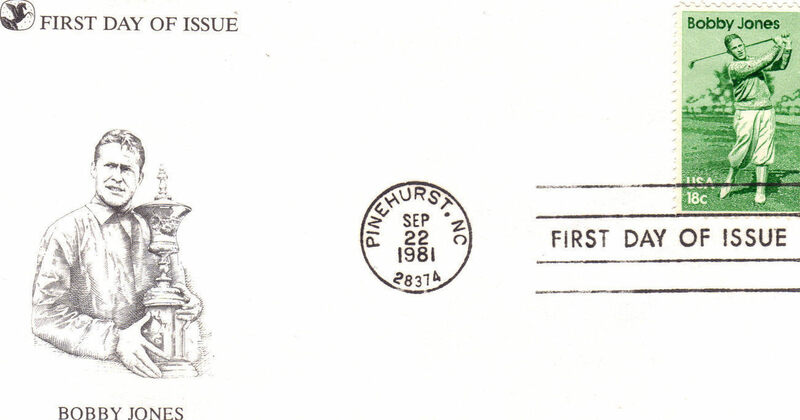 Stamped Pinehurst, NC September 1981. BOBBY JONES is most famouse for his unique "Gtrand Slam" consisting of his victory in all 4 major golf tournaments of his era, both in the US in Britain in a single calendar year 1930. Measures 6-1/2" L x 3-5/8" H Mint condition Send email if you need additional details. Buyer is responsible for 1.95 shipping to anywhere in the USA Canada. Send email for international rates. Do check the store for many more Las Vegas Collectibles daily. Thanks for stopping by!